"Ahhhhh............we meet again Mr Bond." He looks so much like a Bond Film villain in this picture with Lily. I have got this new blog page set up thingy. This is my first post using it so it could all go pear shaped. Alan cooked us a meal on Wednesday. It was delish. We started with tasty mushroom, sherry & wine tarts. The main course was Talapia (fish) in lemon butter sauce with veggies. The dessert was this amazing creation below. This was the dessert as served. This was a few minutes later. Saturday we went to visit two of the foster kittens that we had during the summer. They are doing really well and look fantastic. The boy had been the weakliest one out of the litter and it was amazing to see what a strong, beautiful cat he has grown into. The girl always was pretty but now her fur is even softer. They are really loved in their new home and it was heartwarming to see them. I also think it was very kind of the couple to allow us to visit. After we left there we made our way downtown to The Great Lakes Distillery. I hadn't known this existed until I saw a segment about it on the news the day before. Milwaukee is well known for its breweries but we never knew they had a distillery. It was a brill deal. We got a free guided tour of the distillery by a young guy who really knew his stuff and explained the whole process. It was really rather interesting as he added a lot of history regarding distilling/prohibition etc. After the tour for $5 you can have a tasting of 5 of the different spirits they make. There was whiskey, gin, rum, absynthe & vodka. Philip was driving so he didn't take part and neither did I. I am hopeless at drinking during the day. This was 1pm and if I had drunk those spirits I would have been flat out. Alan made up for our failings. He liked most of them. Philip and I got to sniff them and decided that the rum smelled like rum/butter. The gin also smelled very smooth. They bought a few things. They had shot glasses and t.shirts as well as booze. Have a look at this link. It is very interesting. All in all a good day despite having to clear the snow again before we left. It had to be cleared again this morning but......it is Wisconsin. I think Alan is having a lovely time. I hope so. Currently he is watching the American football ProBowl...........no I don't know either. I am all ok now (mostly). I have my sensible head back on.......as if. Saturday we had a peruse around some furniture shops. The plan was to seek out the cost of a new bed. As we were considering a new bed, I thought it would be sensible (had the right head on) to get a King Size bed. Philip is quite a bit larger than me or as one salesman in the bed shop put it when trying to flog us a decent mattress...."Look at you two. He weighs around 130lbs and she weighs about 30lbs." He should be in a foreign minister or something. He would have given Henry Kissinger a run for his money. We also have numerous felines that like to share our bed. Or, more correctly, they like to share my side of the bed with me. A King Size bed would be a dream come true. Alas, I fear a dream is all it will ever be. They sell beds in a peculiar way over here. You have to buy the headboard, baseboard and frame as one unit. Then you have to buy a mattress and base separately. We found a headboard for around $400 (this was probably the cheapest one we could find that we liked). I, in my innocence, was thinking.....maybe another couple of hundred for a mattress. I was a little off in my calculations. Philip, quite rightly, thought that if we were going to get a new mattress then we should get a decent one. Not top of the range but pretty good. We both suffer with back problems and sleep problems so it would make no sense to get a dirt cheap one. $2500 then...................and that was in the sale........and they would charge delivery........and you have to add on sales tax which would then mean we were talking about $3000. Oh of course, then you have to add on the cost of the bed.....another $500ish. If we had that sort of money to chuck around then I would chuck it at the kitchen or one of the bathrooms. The old bed isn't too bad. Sunday we went to Cedarburg. 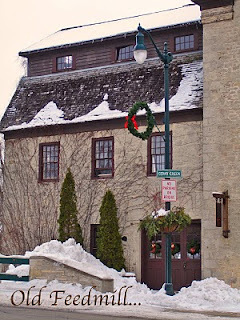 A charming old American town which I think I have blogged about before. The last time we went we had the most amazing breakfast there. So, we thought we would take Alan. 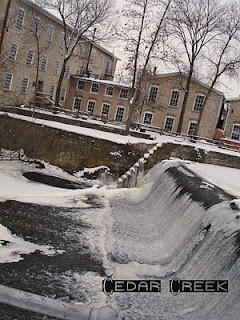 It is a beautiful, small town, with lots of little shops and a fab converted mill. The mill is now a winery. Lots of places to walk around (if you are well wrapped up in January). I had been really looking forward to this. It was pretty crowded in the restaurant, so we had a bit of a wait, but Philip told Alan that it would be well worth it. It was pants.......well mine was anyway. The waitress was a nightmare. She was so over the top, gleefully happy to serve us. Thrilled at our accents which she attempted to emulate. This always winds us up. Why do people think it is cute to try to copy what we say in a dreadful accent? She was going to get us everything "Licketty splitt". I ordered the veggie skillet, which is what I had before. It in no way resembled what I had before. Where were the assortment of vegetables nestling under my 'over easy' eggies? Where were my wonderful, golden crispy hash browns? I got a mound of undercooked white hash browns which had the same texture as mashed potatoes, topped by a couple of pieces of tomato, a few bits of sad broccoli with eggs on top. I would not have said a word about the poorly cooked brekkie. We are British. We don't complain. But, the poxy waitress came to collect our plates and made a big fuss about why I had not eaten my hash browns......which should have been called hash whites. She spoke to me as if I was a child, not finishing my dinner. So, ok, she wanted to know....so I told her. I didn't eat them because they were not cooked properly. Had they been crisp and golden I would have eaten them. Ooooh....just for a moment the mask slipped. She didn't like that. We left our tip and came out. Then Alan told me that I wasn't the only one who left all the hash browns. The lady at the next table had, apparently, left a whole mound of them on her plate. I wonder if she got told off too. For some reason the text is sometimes leaving out the capital letters....I don't know why. I think I am in shock. All these years I have had the niggling feeling that they covered something up. I was told it was pneumonia, but there was a word on two death certificates that I will never forget. That word was burned into my soul. Pseudomonas. A horrid word that no one would explain to me. What was it? It was always fudged over when I asked and I was too weak to insist or to make a fuss. Never, ever make a fuss. 'It was no one's fault. Just one of those things. Put it behind you'. After all these years this word flew off the page as I read this latest news. I always thought that the hospital was at fault in some way. After all this time it has hit me so hard. It needn't have happened. It wasn't my fault. It shouldn't have happened. But it did and I must again 'put it behind me'. The bacterium Pseudomonas aeruginosa has been blamed for the deaths of three babies at Belfast's Royal Jubilee Maternity Hospital, in the neonatal intensive care unit. What kind of illness does it cause? The severity and type of the illness it causes depends on its route into the body. If it enters lung tissue it can cause a form of pneumonia. If the bacterium infects the gastro-intestinal system of a vulnerable patient, then a condition called "necrotising enterocolitis" can follow, which again causes severe tissue damage. This is the form most associated with premature babies. The usual route is through contaminated hands or medical equipment such as catheters and feeding tubes. Infection control measures such as regular handwashing and decontamination of equipment are the most effective tactics to prevent its spread. Once established in a weakened patient, a Pseudomonas aeruginosa infection is potentially a severe problem which requires immediate treatment. While mortality from the infection varies depending on where the infection is, how soon it is treated and the underlying weakness of the patient, some studies suggest a third of infected patients may die. Gary was as good as his word and sent me pictures he had taken at the Ice Hockey. He is a brilliant photographer. The above is one of the inflatable creatures who kept us amused during the breaks in play. These photos show what happened when an official went onto the ice to try to make the monster thingy leave. You can see the official's legs sticking out. It was hilarious and totally unexpected. It then spat his shoes out. This is a picture of the photographer who had a special, personal hole. I think Gary was rather jealous of this. Of course, poor Gary then came in for quite a bit of leg pulling about the other guy having a hole and how Gary must wish he had a hole to poke his thing through. Philip suggested that the other photographer's thingy was bigger than Gary's but that was mere speculation. We also had some chuckles at the players names which are displayed, boldly on their shirts. JESSIMAN emblazoned across your shoulders? We had to scoot home to watch the Green Bay Packers play like a bunch of little old ladies who were on an outing from the Wisconsin Nursing Home for the Bewildered. They played The New York Giants. I won't go into details re the outcome. Philip had to work all night on Monday. This is the first time he has had to do this. They were having some sort of major install (I don't know...he uses lots of words I don't understand...maybe it has something to do with plumbing but I am guessing it is computer related). Anyway, as we live an hour and half from his workplace in Chicago, it made no sense for him to drive home and arrive at 10.30pm when he would need to be back by 1.30am. He would have more or less had to turn round and go straight back. So, he took his little bag and decided to sleep there. He apparently only got an hour's sleep but at least he hadn't had the long drive. So, it was just Unky Al and me on Monday. Tuesday morning I got up, looked out the window..........What the ?????????? Overnight we had had another load of snow and it was still snowing hard. Blizzard conditions. Poor visibility ......the lot. Well, our good old weatherman hadn't mentioned that. Philip then phoned at around 10am to say he was on his way back and should arrive in about 30 minutes. The drive, which had been dug out only a couple of days before, had completely disappeared...well actually the road...the kerbs.....everything was lost in a deep expanse of white.....and Alan was still in bed. Philip would not be a happy bunny if he arrived home and couldn't get up the drive, not after working all night. So, Unky Al was mobilised and he did a great job. It was still snowing hard so we wouldn't usually start digging out but if Philip couldn't get the car in the garage he would have to leave it at the roadside which would mean digging that out later. Philip arrived home in time to help finish off and put the salt/grit down. Phew!!!!!!!! Then I had an angina attack. Pants. It wiped me out for the rest of the day. I couldn't go to work this morning, Wednesday, as apart from still feeling a bit iffy, the temperature had dropped to minus 25C overnight (with windchill). Too chuffing cold to go walking and bussing. The snow now is not like lovely fluffy British snow (when they get it) but is frozen totally solid. The frozen tundra is back with a vengeance. The rest of the week is forecast to be the same with more snow on Friday. Every day he's shuffling ....I mean shovelling. Well we knew it couldn't last. We have been all through November and December with barely a flake or two of snow. We got quite a decent dollop of snow but we have had worse. Much worse. The temperature has dropped dramatically too. Oh well.......it gave Unky Al an excuse to get outside with his shovel. I am quite liking it at the moment. Wisconsin in January just didn't seem right without the snow. I think she is trying to catch up with her feet. She is the kitten with many, many toes, or as Gary calls her "the one with feet as big as her head". 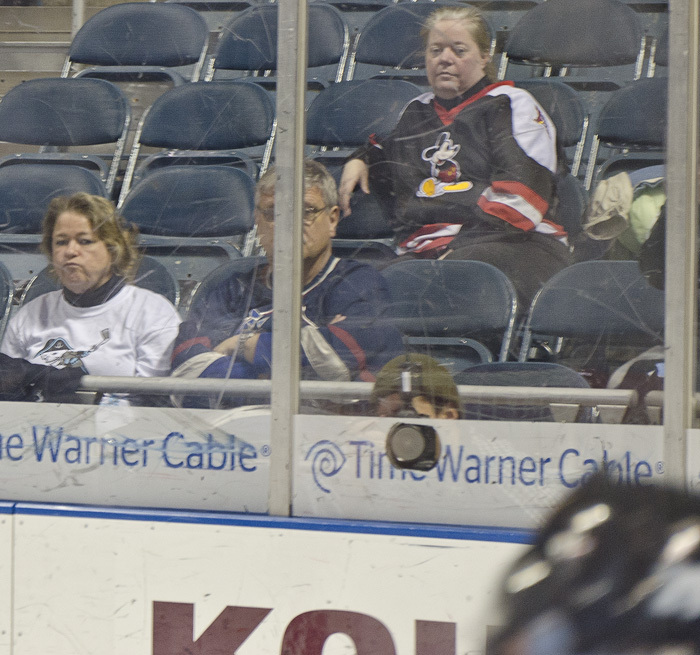 This afternoon, Sunday, we went to see the Admirals play ice hockey. It is a pity they decided to play tiddly winks instead. They were playing the Lake Erie Monsters. We had to leave early so that Alan could get back to see The Green Bay Packers play The New York Giants on the telly. Oh it is all go in this house. Sporting events all over the shop. The Admirals were losing when we left so it wasn't hard to drag ourselves away. They were playing like a bunch of 'big girl's blouses', although there were a couple of punch ups. Gary and I had a giggle making rude comments about the Monster's names and about a guy with a camera. Philip said this guy's was bigger than Gary's ........well Gary took umbrage over that. Gary has promised to send me some photos so I will tell you more when he does. Apart from this.........meh.......I have been feeling a bit down. I wake up in the morning feeling like I have been hit by a truck, and I never have a pen and paper to write down his number plate. I then feel tired most of the day. I think it is depression. If I went to the doctor he would probably say, " Have you had this before?" "Well you've got it again," he would say. I am a bit worried about a friend of mine too. He seems to be having a rough time lately, looking for another job etc. He sounds rather depressed to me. He seems to have lost interest in the things he used to love doing. He has lost his sparkle. I know how hard it is to get through stuff like that. As I am way over here there isn't a lot I can help him with. I hope things work out for him soon. It seems to me that if you can manage to sort out the main problem, then the others soon work out too. Playing World of Warcraft, with a bottle of Jack Daniels to hand and a big fat cat asleep on your shoulder? No wonder he likes coming here. The weather continues to be amazing. We have no snow and temps of 10C. Totally unheard of in January. Apparently records are being broken. Unfortunately, it looks like today might be the last mild day. Cold weather and snow are forecast for us starting tomorrow. 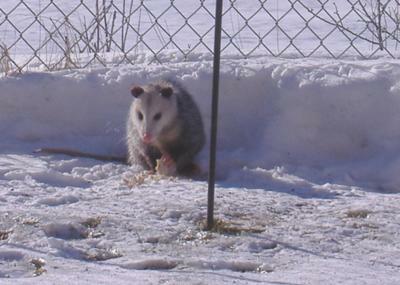 We are not sure how much snow yet but I have an idea that Unky Al may be christening his new shovel. Today Alan and I ventured out to the mall, without headsocks and 8 layers of clothing. This is very odd for Alanmas. When thou doth hath a compatriot in attendance, thou shalt not be harassed by idiots at the stop of the bus...eth. So, the trip was uneventful. The sales are on so I was on the track of Billy Bargains.......I got a couple. Alan kindly accompanied Philip when he took Lily to the vet for her vaccinations. I gave her the tranquilising drug 2 hours before as instructed. Last year it took affect in about 20 minutes. I hated it. She was staggering around and her eyes were dilated. This time, after about an hour and half, there was no effects apparent. No staggering. Sparkling, bright blue eyes. ..........Oh dear. I had to phone the vet as they were leaving to let them know she was on her way. With Lily the plan is ......in......needles.....exam.......weight........done........out......before she explodes. Philip told the vet on arrival, that the meds didn't seem to be working. It seems the vet turned a little pale at this. Lily was pretty good though. They gave her the vaccinations and weighed her but she had had enough by then. The vet was going to examine her belly and teeth but our sweet, white, fluffy, little girl emitted a deep low growl and everyone changed their minds and decided she was done. We think the meds may have been out of date and lost potency. I will get new ones next year. With Alan due to arrive yesterday, I got his presents ready. There was one special one amongst them. Philip picked him up from the airport in Chicago, after work. He'd had a pleasant flight over even if he hadn't got the best seat in the house. The plane went up when it was supposed to, stayed up and came down when it was supposed to. That to me is a perfect flight. Flights should be boring. I never want to be on an 'interesting' flight. After a cup of tea and something to nosh, it was time to open gifts. We all had lots of lovely things. Then Alan came to his surprise present. I have an inkling that he guessed what it was? Coo.....what a surprise for him. He looks very happy with his new shovel. At the moment the weather gods are being very kind to him and this is almost no snow. There isn't any in the forecast for the next 6 days either. In fact, for January in Wisconsin, it is very mild. We are going to make the most of it and get the outside decorations and lights down this weekend. They usually stay up (although not lit) for a few weeks yet as it is generally too cold and the ground too frozen to get them out. This time last year I was waist deep in snow in the back garden. I can't help thinking we will have to pay for this mild weather. Alan seems very happy to be here. I think the cats believe he lives here and has just been out to the shops for a while. It certainly is hard to believe how the year has flown by since his last visit. I like to see how his stress floats away when he gets here, after a year's hard graft on Alcatraz (Guernsey). It is great to have someone to make me a cup of tea and to give a hand with things. No doubt when the snow hits, Philip will happy to see the drive and sidewalk cleared when he has driven all the way home from work in Chicago. I bet everyone wishes they had an Alanmas too. Seems like the winter has been saving itself for Alanmas. I knew the mild weather couldn't continue for much longer. It is cold and snowy now. Not, huge drifts of snow, yet, but very cold. The air is also very dry and my eyes are sore today. I have the humidifier going all night, despite Lollipop's attempts to kill it. She has been doing battle with the thing every day. A couple of times she has knocked it right over and I thought it was broken. But, Humidifier Wars continue......"those damn drips....why aren't they where my eyes tell me they are??" Poor Lolly, her bemusement still makes me chuckle. The covering of snow also brought us some amusement. As you probably know, I feed Arnie The Possum every night. 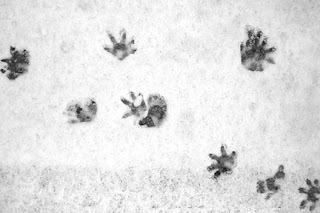 The new snow showed us his tracks. You can tell a possum's tracks from any of the numerous squirrels, because they look like little stars. Their toes are like fingers and they spread out. We have seen them many times before but this time old Arnie made me laugh. We have an old wooden bench swing thing in the back garden. Arnie's footprints were in the snow on the bench. I like to imagine him sitting there, rocking gently eating his burritos that I am still feeding him from the freezer meltdown we had. Maybe I should get him a pipe. I don't know if it the new year blues or what but I have been feeling rather depressed of late. I really don't like feeling like this and am trying to shake it off. I find myself getting tearful at the least thing that goes wrong. That isn't good is it? I expect it will pass.